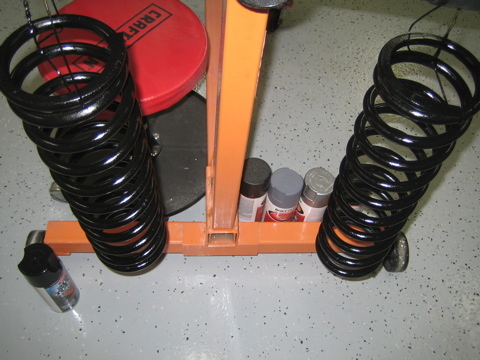 I have had a set of front lowering springs sitting around in my garage for over a year now along with various replacement parts, and several months ago picked up a complete set of front and rear shocks. Decided it was finally about time to at least begin the project. With a whole week of evenings to myself I decided the best bet would be to do the rear first as I knew it would be the quickest - I had only a bit of frame touchup to do, where as the front has several areas I wish to perform rust touchup on as well as more parts to replace. I had picked up an external 'clamshell' type spring compressor a year ago expecting it to make this job easy. I was wrong. Luckily a friend had given me the bolt type external compressors as a Christmas gift. I recommend also renting an extra set from your local auto parts store as it may make it easier if you don't get the angles just right. 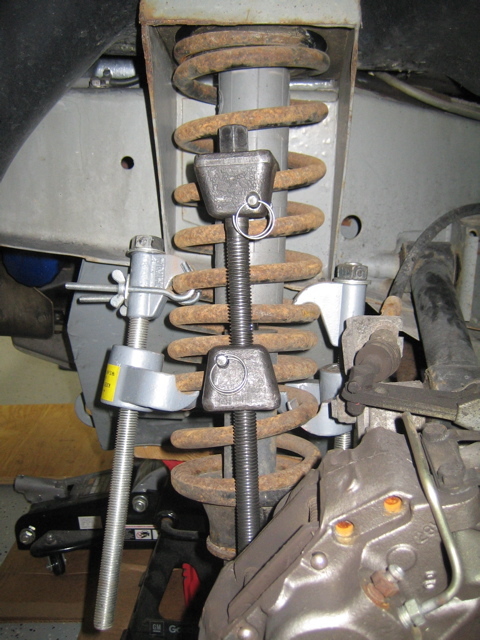 You need to compress at least 4 coils to remove the springs safely, and I recommend cutting your spring compressor bolts shorter so you do not interfere with any parts on the car. 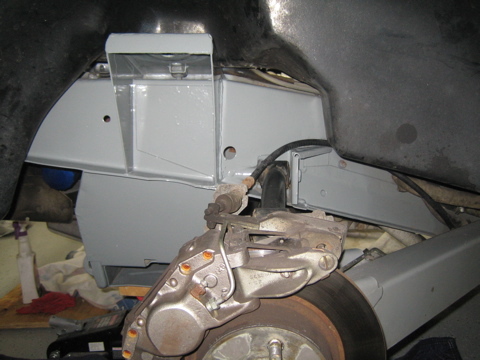 Also do not forget to lubricate the spring compressors with motor oil - this will make it much easier. Once you are sufficiently compressed, loosen the lock nut from the top of the shock and remove. Loosen the second nut a bit to give the shock some wiggle room. 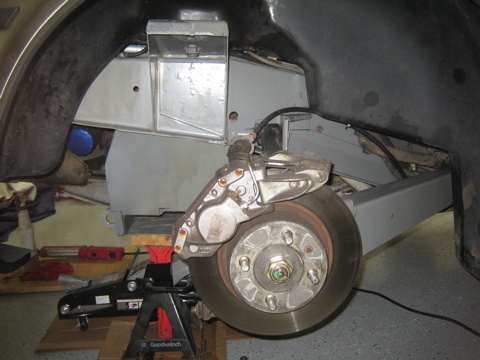 Now remove the large bolt and nut through the hub. You may need to tap it back and then back it out of the shock. Be careful - if there is any tension in the spring it will 'pop' off the bolt when you back it out far enough. Now your shock is hanging from the top bolt. 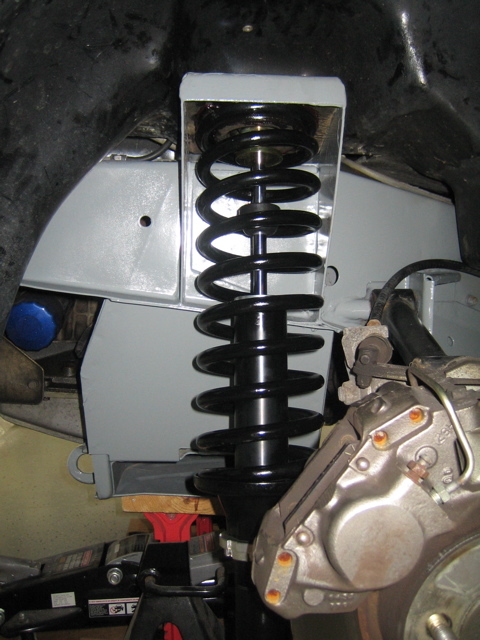 Ensure that the spring is loose from the top shock tower and the bottom cup. Remove top nut fully and drop down/remove assembly. Now remove spring and back off compressors. I decided to keep the rear springs and repaint them. I sanded and cleaned, quick primed, and coated with a black enamel gloss. I used an abrasive wire wheel on a drill, 60 grit sandpaper, and a screwdriver to chip off loose/cracked epoxy. It was mostly on both shock towers right on the edges. I sanded down until I was at bare steel, prepped and painted with POR-15 rust proofing. I also used simple green on the frame. This picture is the 'cleaned' frame and POR-15 coated rusty areas. The POR-15 sections are the shimmery silver spots along the shock tower. I then used a Smoke Gray spray paint that can be found at Ace Hardware. Its the perfect match for the original frame epoxy. I gave two quick light coats to cover the POR-15 and also the frame discoloration. Re-compressed the spring and began the reinstall. 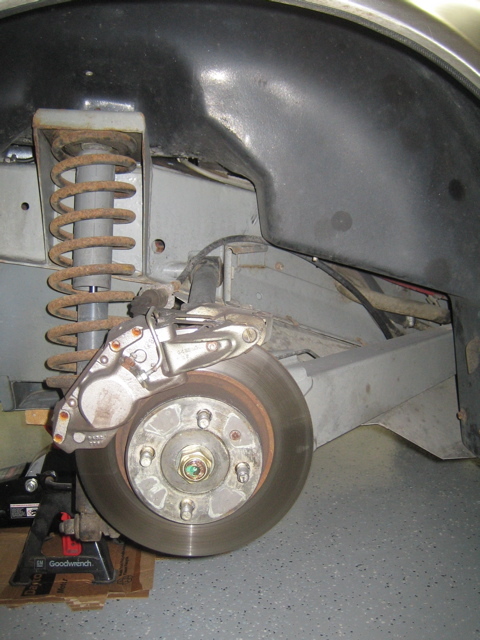 I found it easier to not compress the spring as much and instead use the shock height adjustment to help bring the spring up into its full position. 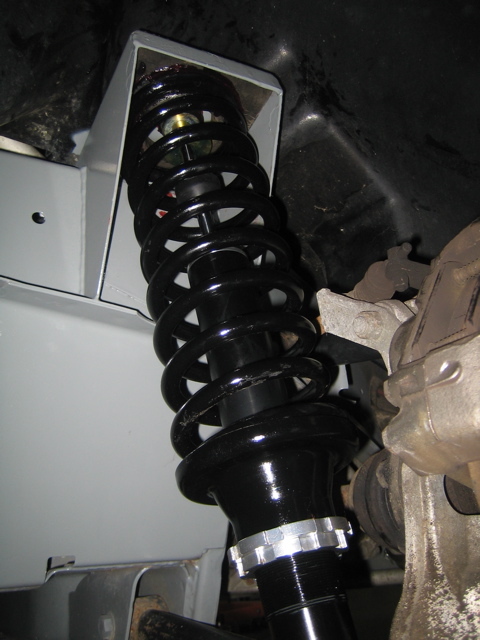 If you are not using adjustable height shocks you will have to compress a bit more than you did for the removal. 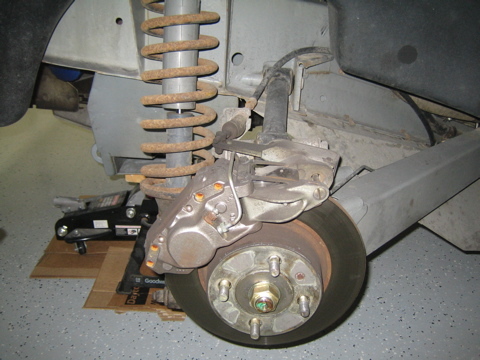 When adjusting my shock height I added a few drops of motor oil so the shock cup did not grind into the adjustment ring. It also made adjusting much easier.